The 1st Class Messenger Bag by Defy Bags ($225) is indeed top of the line – it’s hand-made from reclaimed M35 military canvas and extremely durable cargo truck tarp. As if those high-grade materials weren’t enough, $60.00 worth of Swiss imported solid steel and brass Austri Alpin Cobra quick release buckles are also sewn-in on the bag. 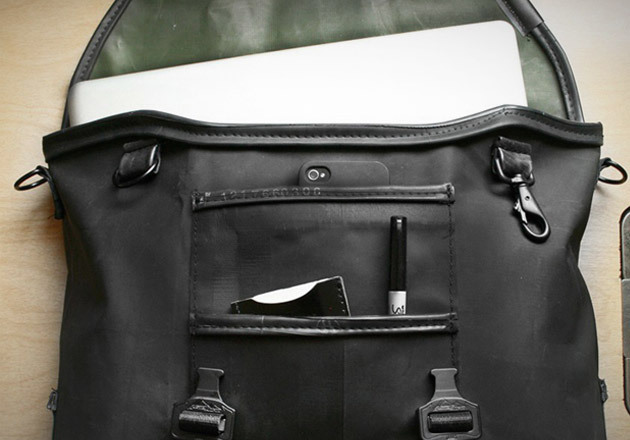 The 1st Class Messenger Bag is sleek black, vintage, and will go nicely with whatever you’re wearing – it’s a bag that will never go out of style.